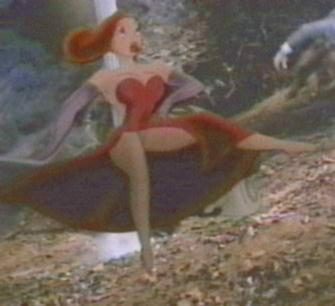 A scene at the beginning of the film depicts a diaper-clad Baby Herman stomping off the set and underneath the dress of a woman. Watched frame-by-frame, the scene reveals Baby Herman extending his middle finger just before jumping underneath the skirt and re-emerging with a spot of drool on his upper lip. This scene can indeed be seen on the home video release and was clearly intentional. In another scene, Bob Hoskins steps into a Toon Town men’s room. Graffiti on the wall reads “For a good time, call Allyson Wonderland”, with the phrase “The Best Is Yet to Be” appearing underneath it. Allegedly, Disney chairman Michael Eisner’s phone number replaces the latter phrase for one frame. Although the “Allyson Wonderland” graffiti is clearly visible on laserdisc, Eisner’s phone number is not. If the phone number was in the film originally (as rumor has it was), it was removed before the home versions of the movie were made available. Animators have traditionally amused themselves by slipping occasional racy frames or other gags into their work, frames which flash on the screen far too briefly to be detected by theater audiences. With the advent of home video and laserdisc players which allow viewers to examine scenes frame-by-frame, these gags can be spotted by sharp-eyed film watchers. Many of these fleeting images are more the product of the power of suggestion than animators’ intentions, however. The Washington Post. 18 March 1994 (p. D1). Daily Variety. 14 March 1994 (p. 1).